For the third week in a row, the 2019 Monster Energy AMA Supercross Series produced its third different winner and the second first-time winner in a row. 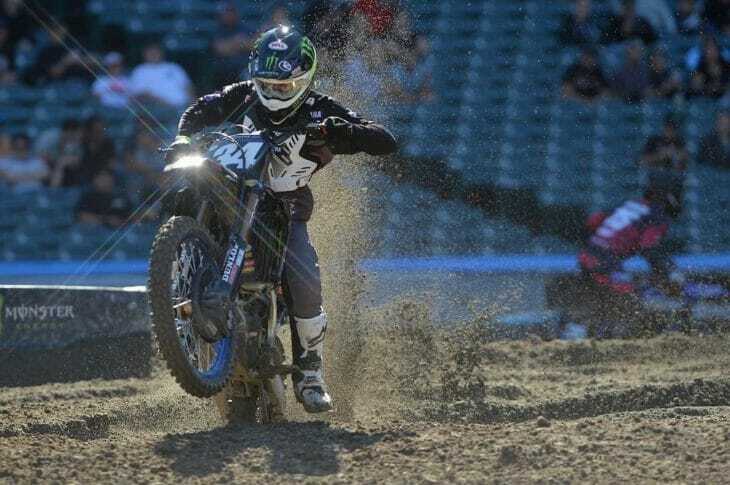 Taking center stage at Angel Stadium of Anaheim after all was said and done was Cooper Webb who was impressive all night and looked like the Cooper Webb of old. 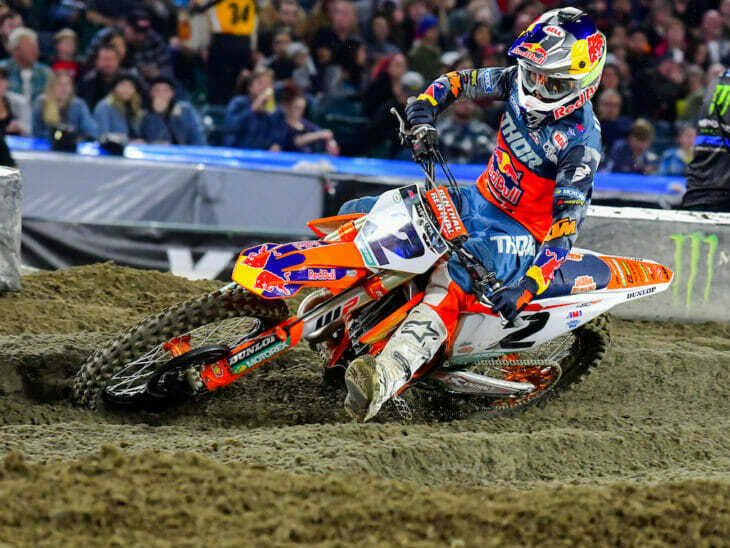 Webb won the first 450SX race in dramatic fashion, passing veteran racer Ken Roczen (Honda HRC) in the last turn. In the second race, Webb led from start to finish, unwilling of bending to the pressure put on him late in the race by his Red Bull KTM teammate Marvin Musquin. Webb was in good shape going into the final race. He went into it with a 1-1 and the closest rider to him was Musquin with a 3-2, so he had plenty of breathing room. He got through the first turn cleanly and in second place, right behind holeshotter Eli Tomac. When Musquin came calling while running in third, Webb made full use of his points cushion and didn’t give his teammate much of a fight, and soon Musquin had second place. Webb then cruised to a third-place finish and his first career 450SX victory. Webb took the overall win over Musquin, his 1-1-3 score easily besting Musquin’s 3-2-2. Third overall went to Tomac who finally broke out of his early-season shell in the final race of the night. He shot into the lead right off the start and simply blew everyone away, taking the checkered flag approximately five seconds ahead of Musquin. Before busting out the Tomac of old, the Kawasaki rider rode to two very quiet fourth-place finishes. Roczen, who saw a possible first-moto win ripped out from underneath him by Webb, ended up fourth overall via 2-5-4 race finishes. 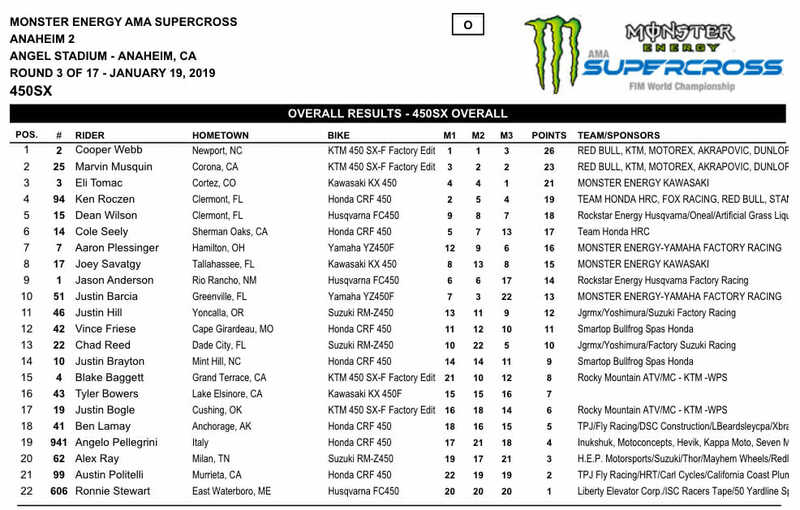 Rounding out the top five was a steady Dean Wilson (Husqvarna) with 9-8-7 results. Blake Baggett (Rocky Mountain ATV/MC/KTM/WPS) appeared to have lost his mojo from his Arizona win the weekend before. He was 14th in qualifying and struggled with his starts. Even then, he couldn’t find the magic he had last week and went 21-10-12 on the night for 15th overall. Defending champ Jason Anderson (Rockstar Energy Husqvara) also seemed to lose some of his spark that he had going after placing second in Arizona. Anderson went 6-6-17 in Anaheim for ninth overall. But the opening-round winner at Anaheim 1 had a worse night than either one of them. After going 7-3 in the first two races, Justin Barcia (Monster Energy Yamaha) crashed and was slow to recover, eventually needing help off the track. He was driven back to the pits for evaluation. His condition is not yet known. Roczen is still the points leader in the 450SX class but by only two points over Tomac. Webb is another four points back in third. Barcia still holds down fourth but shares it with Musquin. 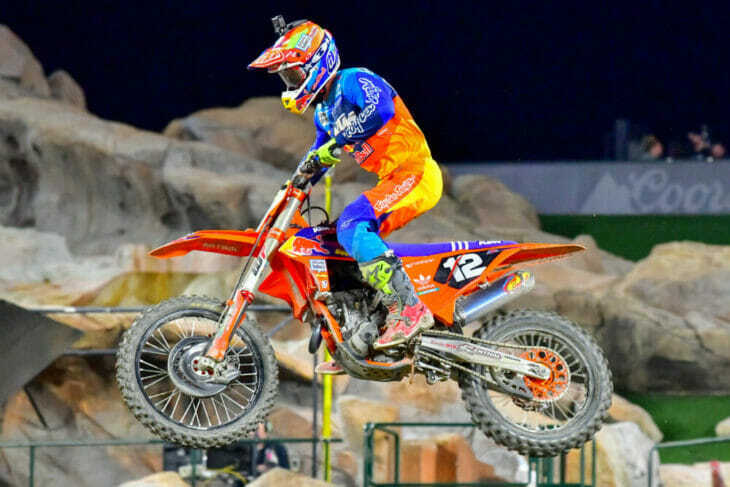 Shane McElrath took the 250SX West-class win. 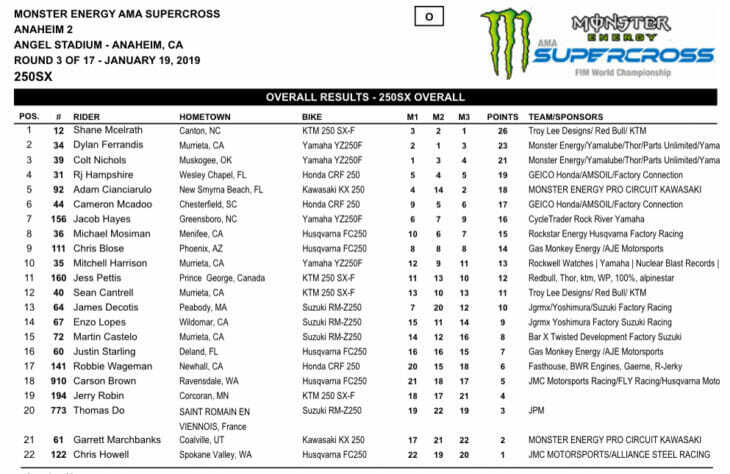 The 250SX West class produced three different race winners: Colt Nichols, (Monster Energy/Yamalube/Yamaha) Dylan Ferrandis (Monster Energy/Yamalube/Yamaha) and Shane McElrath (Troy Lee Designs/Red Bull/KTM). But when the points were tallied, McElrath came out on top. But it was close. Both McElrath and Ferrandis tied on points based on their moto results. Both tallied a combined low total of six, but McElrath won the tie-breaking final moto to take the overall victory. McElrath finished out the night with 3-2-1 moto finishes and Ferrandis 2-1-3. Nichols ended up third overall with 1-3-4 moto finishes. Adam Cianciarulo (Monster Energy/Pro Circuit/Kawasaki) ended up being the spoiler for Ferrandis. In the final race, Cianciarulo was holding down second place and was the rider standing between the Frenchman and the overall victory. At one point, it looked as though Ferrandis was going to get Cianciarulo but a series of small mistakes allowed Cianciarulo get away from the Frenchman. MeElrath, however, took things in his own hands and blasted into second place at the start of the third race. He ran down early leader Cianciarulo, passed him on the fourth lap, and flat out pulled away for an impressive race win. Cianciarulo was fast all night but mistakes and crashes hurt his chances for the overall. He ended up fifth overall via 4-14-2 race finishes. Fourth overall went to RJ Hampshire (Geico Honda) who was consistent with 5-4-5 race finishes. Despite the night going downhill for Nichols after winning the first race, he still leads the championship and will again sport the red plate going into the next race in Oakland. But he has anything but a comfortable lead; McElrath is just two points behind him. Ferrandis is another five points back, just one point ahead of Cianciarulo. 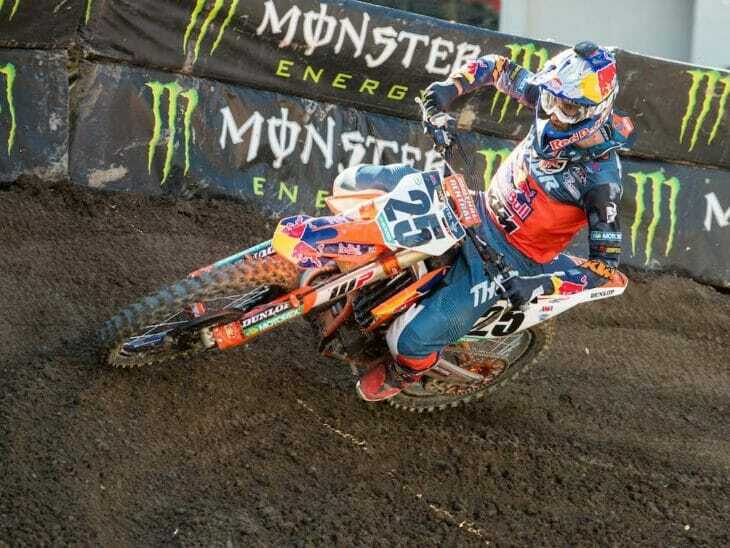 Marvin Musquin (Red Bull KTM) and Dylan Ferrandis (Star Racing/Yamaha) were the top qualifiers. In the 450SX class, Musquin saved his best for last, dropping Eli Tomac to second place on the final lap of the third and final qualifier. 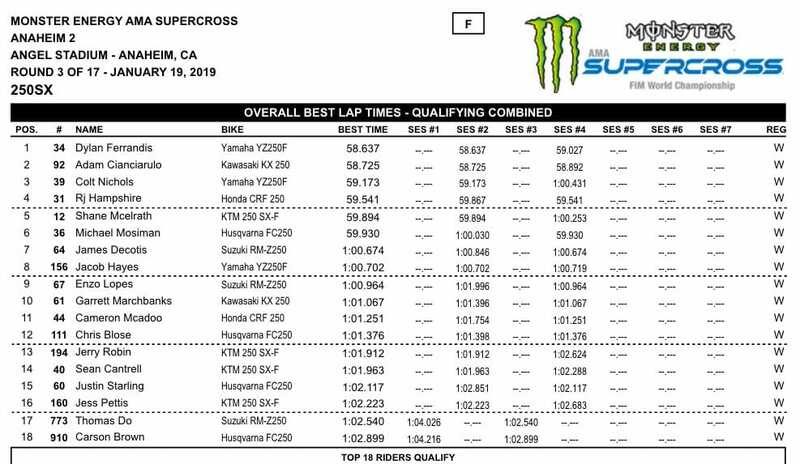 Musquin edged out Tomac with a 57.660; Tomac’s best lap was a 57.794. They were the only two riders to crack into the 57s. Third best was Ken Roczen (Honda HRC) with a 58.381. Justin Brayton and Jason Anderson rounded out the top five in the 450SX class. Last week’s winner in Arizona, Blake Baggett was only 14th quickest. 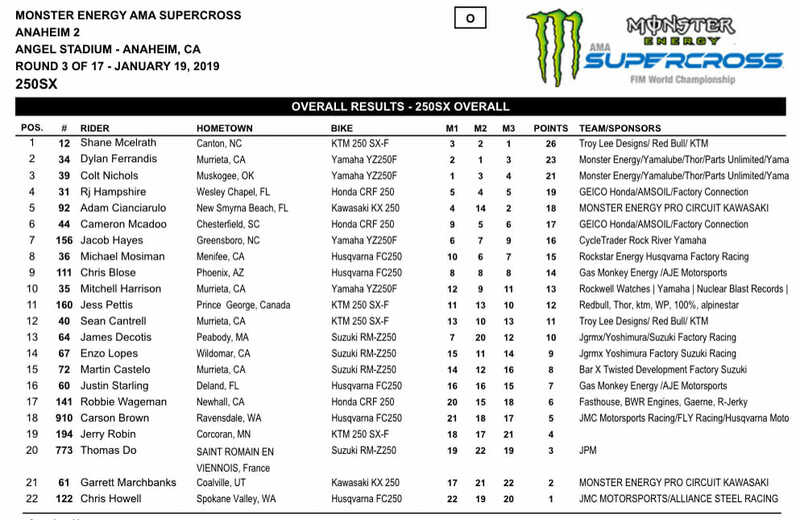 In the 250SX West class, Ferrandis edged out Adam Cianciarulo with a 58.637 to Cianciarulo’s 58.725. 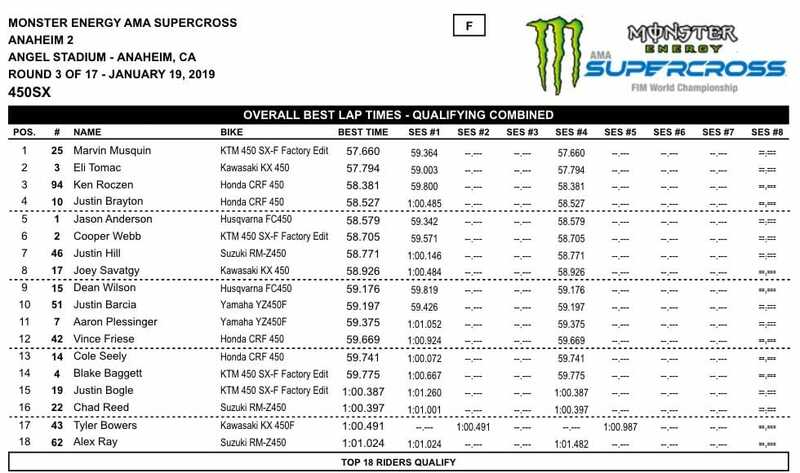 They were the only riders in the 250SX class to break into the 58s. Next-best rider was points leader Colt Nichols with a 59.173. RJ Hampshire and Shane McElrath completed the top five. After a week of heavy rain in the Southern California area, the Anaheim 2 track is in ideal shape. Mud has been pushed off to the sides of the track, leaving the racecourse tacky and rutted in some places. Dust was even seen in the early practice sessions, but the entire track should be moist by race time. Joey Savatgy, who suffered a concussion at the last race in Anaheim, is racing and qualified eighth in the final 450SX qualifier. The Anaheim 2 race is also round one of the Triple Crown series (rounds two and three are in Detroit and Houston), which means each class (250SX and 450SX) will compete in three main events, 12 minutes-plus one lap each for the 450s and 10 minutes-plus one lap each for the 250s. The rider with the lowest combined results is the overall winner for the night.